The petal-prettiest time in the Eastern Sierra is nearly nigh. The petal-prettiest time in the Eastern Sierra is nearly nigh. But how to find the flowers you want to see? Mono County Tourism has tips. HOW MANY FLOWERS... do you drive by while toodling around the back byways of California? We know, there are a few different levels and asterisks to that question. Do the blossoms need to be right along the road? Or are we talking in the general vicinity of the highway? Also, should the buds be fully open to qualify, and what of those flowers that have lost most or all of their petals in the wind? We won't put anyone to this test, for no on-the-road adventurer could accurately answer such a whimsical question. But we will ask this of backroaders and off-the-beaten-pathers: If you were to drive by a field of flowers you'd never seen in a wild setting, such as an expanse of blue-purple lupine stalks, would you safely pull over, park, and bound out of your vehicle with joy, enthusiasm, and, don't forget it, your camera? It's a yes-no question, and we're betting you said "yes," without delay. 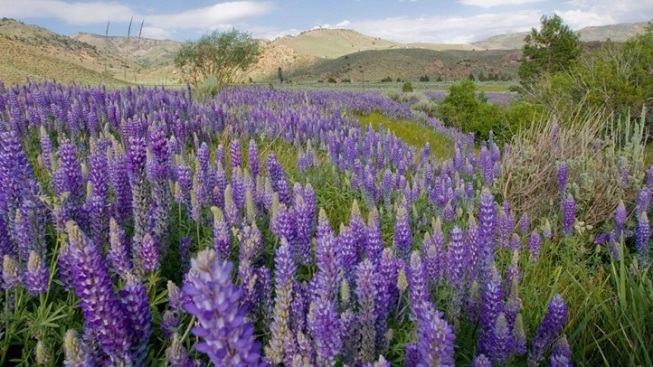 GOOD THING... such a wide variety of blossoms grow in the Golden State, and very much so in Mono County, where lupine flowers and Mojave asters and fiddlenecks and a host of plant- and shrub-based buds pop up later in the spring and early summer. This is the Eastern Sierra area, with some elevation changes, so the lower desert-y flowers will soon make their showing, while the higher slopes will hold out for summer, or close to summer's start. Mono County Tourism wants to help outdoors lovers to find these flowers, via an online BLM guide called Wildflower Hot Spots of the Eastern Sierra. There are maps, and tips on where to look and when, and once you spend a half hour perusing the info on Mazourka Canyon, and Fish Slough, and Tioga Pass, you may want to load up the trunk ASAP. But take note of your favorite flower's timing, and when your favorite area of Mono'll be putting on its annual show. Will it be the lupines this year for you, or poppies, or a new flower? Or all of the above?